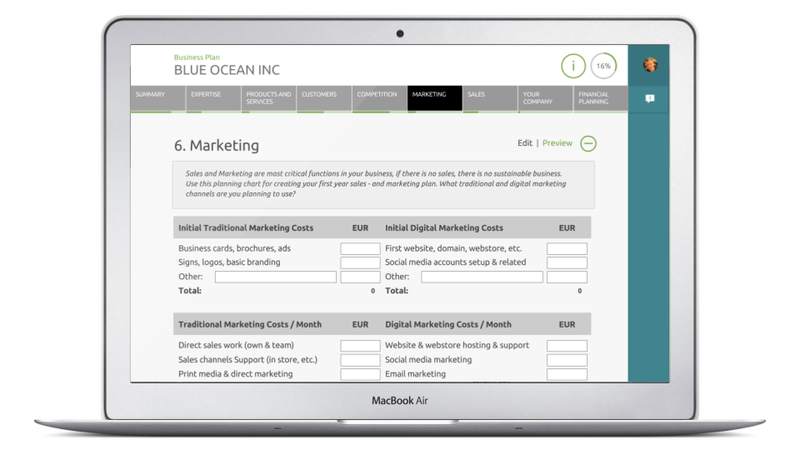 "Online Business Planning Tool for new entrepreneurs, SME's and startups at growth." Business Planning online application for new entrepreneurs, SME's and innovative startups at growth stage. ​Application serves as scalable support tool for creating business plan, including “mentor questions” per each topic to help create the initial business plan and financial models. Initiating formation of key business data. Business Plan Tool serves as a scalable support tool for creating business plan, including “mentor questions” per each topic to help create the initial business plan and financial models for funding, profitability and sales modelling. The application offers scalability, measurability and connectivity compared to downloadable business plan templates, due availability, data & analytics, mandatory fields and guided process for support services, enabling significant efficiency increase for business advisory meetings. In addition for actual business plans, this tool is also used among students for education purposes. As an online tool designed to be hosted and provided as SAAS approach by local key organizations to entrepreneurs and SME’s in their region.